City of Calgary, January 2, 2019 – As oversupply continues in Calgary’s housing market, December prices eased by one per cent compared to last month and are over three per cent below last December. “Persistent weakness in the job market and changes in the lending market impacted sales activity in the resale market this year,” said CREB chief economist Ann-Marie Lurie. December sales totalled 794 units, a 21 per cent decline over the previous year. Overall year-to-date sales in the city totalled 16,144 units. This is a 14 per cent decline over 2017 and nearly 20 per cent below long-term averages. Inventory levels in December sat at 4,904 units. This is well above levels recorded last year and 30 per cent above typical levels for the month. Elevated resale inventories in 2018 were caused by gains in the detached and attached sectors. Throughout 2018, the months of supply remained elevated and averaged 5.2 months. This contributed to the annual average benchmark price decline of 1.5 per cent. Price declines occurred across all product types and have caused citywide figures to remain over nine per cent below the monthly highs recorded in 2014. “Both buyers and sellers faced adjustments in expectations this year. 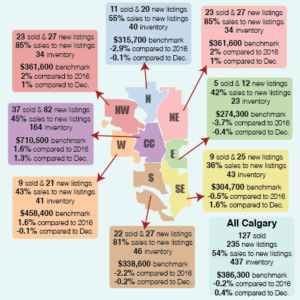 Sellers had to compete with more choice in the resale market, but also the new-home market,” said CREB president Tom Westcott.